Mulgrew speaks of weekend snowstorm, says too early in year to use our one snow day. National—Speaks of shutdown, how it affects country, working with advocates to support workers, in conjunction with AFT. No one knows where it’s going. Reported Mueller investigation is coming to a close. Uncertainty not good but we need period of uncertainty to get to better place. Workers being used as pawns. Why do workers always have to suffer? Why has it always been this way. First and foremost, we support workers. Will work with NYSUT, AFT, NEA to support. Betsy DeVos moving to stop protection against predatory institutions, and her family has tens of millions in these institutions. LA—Major piece for us, knew LA was in trouble years ago. Was in middle of defund public education. They have a school board. Was very expensive election. 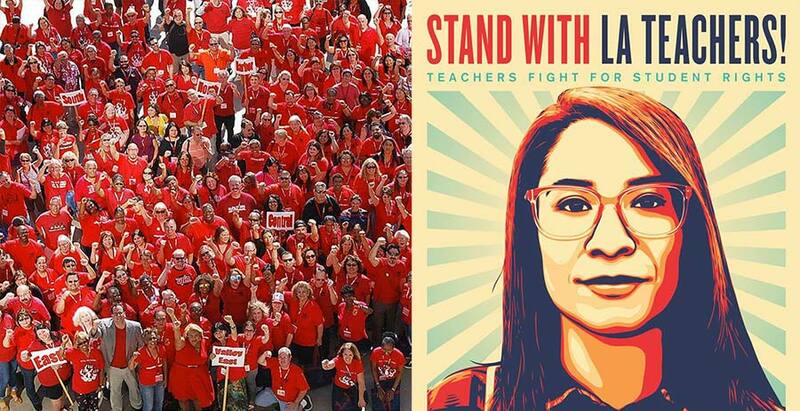 Teacher unions spent over a million as Broad and friends spent multiple millions to charterize. Lost by one seat. Broad has decided not to invest as LA teachers haven’t had raise in ten years. The strike is inevitable as they had nothing else to do. NY State averages 19K per student, LA at 12. Working with teachers, supporting. Message on target. Fighting for wraparound services, counselors, social workers. Our enemies say this is just about teachers hating charters, but about us serving community and children. Other side will try hard to change narrative. About what happened last spring, saw it coming for years. When we had Bloomberg we had to deal with recession. We looked at how to preserve system and avoid layoffs. Not one UFT teacher was laid off. When we came out of recession was about funding public ed. In other places they just started starving public ed, so as to discourage it and turn it into market system. Ten years ago, people thought we were crazy talking about this. Now, people are saying we were right. When we came out of recession Bloomberg was leaving and Cuomo said we wasted money on public ed. Said we just wanted raises and didn’t care about kids. Before that we knew he was dealing with same people LA was dealing with. We got ahead of them, along with state union. Did not allow this scheme in NY. Had lot of action and activity. Yesterday, at State of State, Cuomo said how proud he was that in last three years NY contributed more to ed. than any other state. That is our work, protecting profession. When we look at LA, we have to help them because we can’t let these people succeed in scheme to privatize. We are good example of what happens when we fund ed. We have 75% grad rate, highest ever. Money matters. You want people in office who take pride in supporting public ed. We worked to change Senate. Women’s rights, medical and workplace, stressed, We want better voting possibilities so we become number one in participation. We want stronger laws to protect unionized workers in face of Janus. We want environmental protection, middle class tax cut. There are ten states that give more money to feds than they get back. We are number one in giving. Giving states all vote blue. Tax plan was attack on us. NY State will finally pass DREAM act. Will be affordable housing, rent control regs. Overall ed. number not satisfactory and we will fight it. They want to change funding formula based on need, not political leverage. Are you spending money where there is the most poverty? Not always the case in NYC. Whenever they say based on need, they are not talking only about NYC. NYC is not in big five. Rural districts are very poor. We have been advocating for this for years. Now possible because Senate is controlled by pro-education elected officials. Elections matter. In past, we couldn’t include this in budgets. Senate liked charters. Now we can put out an agenda and get things done outside of budget. APPR—Ten years ago test scores were supposed to be part of evaluation. Obama administration made this requirement for federal aid. Last year we finally had bill we wanted, Governor, who now loves us, said he would sign. We had everyone but six Senators. Senate would not put it on floor unless we lifted NYC charter cap and agreed to additional funding only for charters. We then opposed them in elections. They felt don’t worry, we’re only screwing NYC. On Friday afternoon at 4, Senate and Assembly introduced same bill, will go to Senate on Tuesday. We don’t want to wait—are hoping within two weeks we will finally have no mandated test scores in teacher evaluation. We’ve made great gains in graduation rates. We don’t think a future mayor will reverse pre-K. De Blasio said he would work on this, and he will have added two whole grades to our school system. Huge undertaking, considering 100K students per grade. Most school systems don’t have 100K students. Now illegal to ask about citizenship in census. Its results are tied to 700 million in education funding in this state. Assuming this may be pushed to SCOTUS. If it doesn’t go to this session it will be too late. We have to help everyone in this census last time. We lost representation and money last time. 76% answer nationally, but in NYC only 61 answer. We should think about working to increase participation. Majority of community shows up every day in schools. Census designed to count residents. George Washington wrote we never want immigrants to feel they don’t belong. Using operational part of contract. We already have resolutions. New but powerful tool. Already getting friction from CSA and principals. Don’t like to listen to us. This is major accomplishment, but useless if we don’t use it. Paperwork has helped 500 schools, but probably many more did not use process. All standards, including safety standards agreed upon. Will be going out next week. Women’s march this Saturday. Breakfast in midtown. Now are three separate marches. We are holding breakfast for anyone who wants to come. Public advocate race—Feb. 26 election, 23 candidates. Had three forums, but petitions not done yet. Will decide whether or not to move forward with endorsement. We never endorse before petitions certified. Earliest will be Friday. LeRoy Barr—CTE awards 2/8 here. Black History Month film series—2/7—Anthem is Future, about Eagle Academy Schools. Pre-release chance to see it. People from film will be there. 2/14 story of Reginald L. Lewis. 2/28 Brother Outsider, 3/7, We Are Rising, about HBUs. March 16 Early childhood conference. Paras luncheon March 23rd. Women’s history brunch March 31. Nominating petitions downstairs. Mulgrew—Bomb scare on Broadway right now. Just cleared. 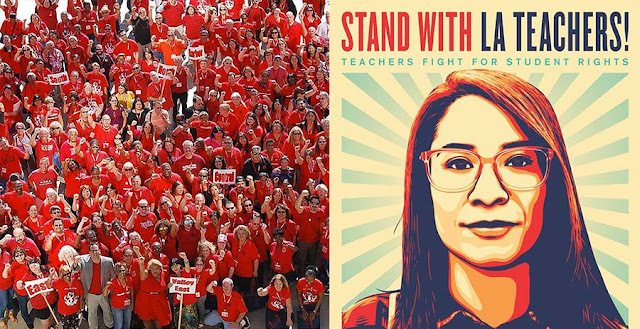 Q—How will UTLA strike affect us? A—We want to get out what’s happening with public ed—defunding. LA is second largest system, 600K. Why so neglected? How did it fall behind? What’s going on? Broads, Waltons, started trying to charterize city school system. Colleagues in LA have to talk about what they need to do their job. That’s what’s at stake. Other side will say ed. drains taxes and charters are better model. Yet LA charters don’t perform well. We do this to help children. Think where we were ten or twenty years ago. Public thought we were all lazy, didn’t like kids. Took work to change. We must continue. Hard to roll back. Fighting for future of public ed. That’s why we must implement contract. Bronx plan not about money, about saying when schools work as group of professionals they will get better results. This is what PROSE is about. We want to show people how things work. We need to change dialogue from DC. Q—Bloomberg hates teachers. We would like to know what’s going on with his presidential aspirations. What do we do? A—Hopefully nothing. Many asking for UFT comments. At this point, that election is far away. Our Senator starting exploratory. In terms of us, union position is what’s in our interests to protect profession and unionized workers. Clearly not DC, but Betsy keeps talking and doesn’t help herself. Do we really need another billionaire after this one? Q—Chancellor Carranza second in row who is bilingual. What are we doing about students who are monolingual? Will they receive same training as bilingual? What’s union stance on how we move forward with multilingual population? A—What are we going to do with monolingual adults? We screwed this up as country, starting language education in high school. Last chancellor place dual language in early grades. Embarrassment to country we don’t do better. Challenge to hire bilingual teachers. Challenge to hire teachers at all. Open to mutual agreements to have people switch certificates. Working at state level and with DOE. Good that NYC beginning to deal with this issue. We are most diverse city on planet. Most diverse space in Queens NY. Q—Dean asked union stand on discipline code. Student got 6 day suspension for butterfly knife. Used to be 30. Dean fearful you have to kill someone to get in trouble. A—Discipline code looks like a phone book. Size of knife makes difference in code, crazy that a half inch makes a difference. Safety standards are important. School needs to have conference with parent, but why is child bringing knife to school? Has to be conversation. We need to discuss what goes on in school. Zero tolerance means we suspend everyone. Sit in circle doesn’t work either. We need whole school approach. School must be positive place to be. Union offers training, and helps come up with plan. Can’t talk to everyone for three hours. A real plan can help. Rich Mantel—resolution—support federal employees during partial shutdown. Urges GOP to stop insisting on border wall. Motion to make it first resolution tonight. CL—Resolution for this month—to support New Museum employees to unionize, have living wage, UFT stands with employees. Janella Hinds—Moves it becomes number two. Resolution—to promote Democratic engagement of union members. Point of order—Doesn’t believe it’s in order because materials already adopted rules, and Exec Committee passed. Mulgrew—Constitution says election committee will adopt rules. Believes it’s out of order because it has already been done and adopted. Point of order—DA is highest decision making body and would supersede. Mulgrew—Can put it to body. Will rule if it’s out of order. Supporting federal employees—Rich Mantel—folks not getting paid. No reason for that over stupid wall. Folks not getting paid. Please support. Amendment—Would like to call wall immoral. New Museum Employees—CL asks we vote in support. We should stand with them. Black Lives Matter resolution—Dermot Myrie--UFT should support as part of action for cultural institutions. We should implement restorative justice, have ethnic studies. Jia Lee will be able to teach this in her classroom. Week of action February 4-8. We have to rebuild union from bottom up. Resolved UFT will make demands on DOE to undo systemic racism. Point of order—Last month this body approved resolution in support of economic justice, believes this is out of order. We did support BLM and supported activities through year. We reaffirmed support of initiatives including BLM, promoted respect and inclusion. Believes it’s moot and redundant. Asks chair to rule. Mulgrew asks maker of motion to respond. Myrie—Were you at NEA summit in July? Mulgrew—rules Myrie out of order. We already support and will continue to support. Training to CLs and delegates—CL—resolution to get DA training so we can learn how to write resolutions and use Robert’s Rules. Meetings powerful when people raise voices. Union based on solidarity. Gives chapters voice within this body. We need tools to make members feel they have voices. Please support. Dave Pecoraro—As someone who’s done training, it is an empowering act to do it. Supports. Serling Roberson—Resolution on Medicare negotiating drug prices. Will benefit many. NYSUT, NEA, AFT reiterate position that Medicare negotiate. Supporter—Retiree—Would pay 200 for three month supply, when you hit gap you have to pay four times that much. Mulgrew—We fight with drug companies and they can just raise prices 3X cost of living. Feds gave them blank check and we are paying. Paul Egan—expand voting rights—NY embarrassment in voting rights, many people can’t vote, long lines, people can’t change affiliation. When NC brought up for voter suppression, NY’s voting rules cited as defense. Bill will help a lot. One thing to pass, another to implement. Asks for support. Peter Goodman—We can register 16 and 17 year olds. Untold numbers of students we can get to. Many of our people don’t bother. Will be part of instructional program. Supports. VP Special ed.—Support our brothers and sisters in LA. Snapshot of entire country. Asks for support. 6 PM We are adjourned.